This group of human rights defenders remain convicted of a serious terrorism-related offence. They were tried in relation to their attempt to prevent the deportation of a group of people at Stansted Airport in 2017. Their actions – which at no point harmed anyone – prevented the flight from leaving. Of the 60 individuals due to have been deported, at least two have since been granted permission to remain in the UK, with others still pursuing their claims. Initially, we should recall, the Stansted 15 were charged with aggravated trespass, a relatively minor charge of the type that has often been used to prosecute people who have undertaken similar protests. But four months in, this was changed to “endangering safety at aerodromes” – a very serious terrorism-related charge which came onto the books following the Lockerbie bombings – and one which has a maximum penalty of life in prison. ….The way the Stansted 15 have been treated should be a matter of grave concern for anyone who cares about human rights in the UK. This case is a canary in the coalmine and we should be alert for the chilling effect this trial could have on peaceful protest in the UK….It’s easy to see how what has happened to them might give pause to others seeking to stand up against perceived injustice. Throughout this case it’s been clear these are human rights defenders, motivated by conscience and compassion for their fellow humans. 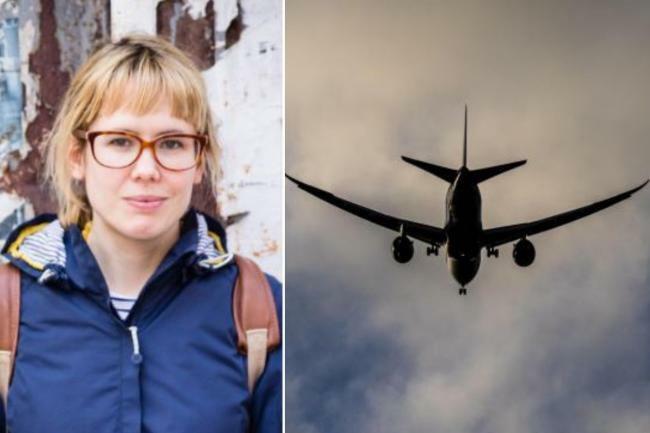 Emma Hughes grew up in Epsom and was one of 15 activists who helped block a charter flight at Heathrow airport in March 2017. Emma Hughes is a charity worker who recently gave birth to a son, Fen. In December last year before learning of her sentence, she told the Surrey Comet that the trial and subsequent conviction, which she might have faced up to life imprisonment, had severely impacted her pregnancy. Hughes said: “My partner faces not just me going to jail but his first child as well. It’s very scary for everyone’s families as well as us.” 12 of the activists, including Hughes, received community service sentences, while three others were given suspended prison sentences. [On the night of 28 March 2017, in a corner of Stansted Airport they locked themselves on the runway around a Titan Airways Boeing 767 plane due to deport around 50 people to Nigeria and Ghana. Using arm tubes and tripods, they stayed there for over eight hours, stopping it from taking off. After a grueling trial which ran from 1 October until 10 December 2018, 15 members of the campaign group End Deportations were found guilty by a jury of “intentional disruption of services at an aerodrome”. The conviction, under the 1990 Aviation and Maritime Security Act – a law passed in response to the 1988 Lockerbie bombing – centred around the apparent danger posed by the Stansted 15. The 15 are appealing their conviction and have called for their terror convictions to be quashed and hostile environment dismantled. In a statement, the Stansted 15 said: “The convictions will drastically limit our ability to work, travel and take part in everyday life. Yet, people seeking asylum in this country face worse than this: they are placed in destitution and their lives in limbo, by the Home Office’s vicious system every single day.